application epoxy floor system that provides excellent adhesion and durability. Garage Floors, Storage Areas, Walkways (non-skid system) and Commercial use. 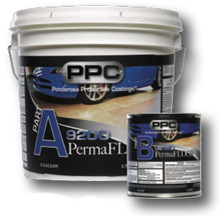 A low VOC primer and sealer with early water resistance and excellant adhesion. Topcoat your floor with 9600 PermaCLEAR to achieve maximum durability and chemical resistance. How long before we can return floor to service? You may return floor to service 24 hours after last application. When will the floor need to be re-coated? In service areas or high-traffic areas re-coating may be necessary typically within 10 years. Normal residential garage use and proper floor care will extend service life. How do I care for my new floor? Epoxy floors are non-porous. They are relatively easy to clean, because contaminants cannot penetrate the surface, they stay on top. Epoxy floors will not be affected by most cleaning compounds if they are used properly and the floors rinsed thoroughly afterwards. Can we use 9200 PermaFLOOR outside? Yes, outside application would require 9600 as a topcoat, for UV protection. Consideration should be given to adding a non-skid additive for slip resistance. Does applying 9600 clear gloss coat improve durability? Yes, 2x as flexible as a urethane and 3x as durable as an epoxy. Color Disclaimer: Due to individual computer monitors and settings, the colors in the color chart may vary slightly. Please contact us for a color chart brochure to determine the accurate color required.